Range of GI Values is Small It Doesn't Account for How We Eat Enter the Glycemic Load Problems with Research So, What Should We Do? The glycemic index was developed to inform us about the degree to which carbohydrate foods raise blood sugar. Several popular reduced-carbohydrate diets, such as the South Beach Diet, use the glycemic index. Still, contradictory and somewhat confusing issues surrounding using glycemic index numbers when choosing specific foods to eat. A lot of reliable research shows that eating a diet with a relatively low blood glucose impact can protect us from diabetes, and likely from heart disease as well. Therefore, choosing foods that are less likely to rapidly raise our blood glucose can be a healthy way to eat, especially for those prone to insulin resistance, diabetes, and heart disease. Researchers use a group of healthy (disease-free, including diabetes) people to determine the index. The individuals eat a food with a standard amount of carbohydrate, usually 50 grams. Their blood is tested every 15 minutes to see how much and how fast their blood sugar rises. The higher and faster it rises, the higher the score the food is given, on a scale of one to 100. Less than 55 is considered to be a low GI, higher than 70 is high, and in between is medium. It's important to note, however, that while GI scores are based on research, these cutoffs were assigned in an arbitrary way. 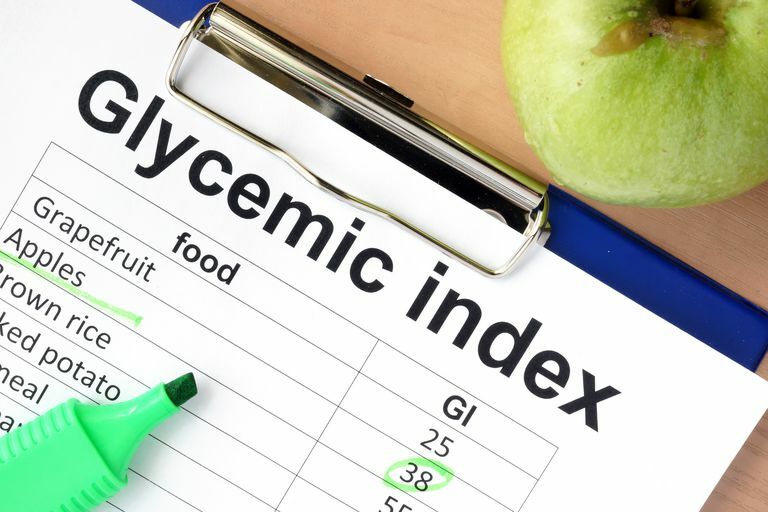 Although it would indeed be extremely useful to have a good measure of how glycemic various foods are, the glycemic index has several problems. The most important ones are the small number of foods tested, the fact that different people react to foods differently, the small range of GI measurements, the variability of foods tested (the studies are done in various labs around with the world with various-sized groups of people, different recipes, etc. ), and the fact that the glycemic index doesn’t simulate the way people actually eat. The main foods tested for the glycemic index are those high in carbohydrates. Remembering that the standard amount of carbohydrate is 50 grams, spaghetti is included in the index because it is reasonable that one could eat 1 and ¼ cups of spaghetti (the amount it would take for you to get the 50 grams). On the other hand, it would be quite difficult for you to get 50 grams of carbohydrate from eating broccoli; you’d need to eat between 16 and 22 cups of it in a sitting. So, broccoli – and other foods for which it would take a lot for you to tip the carb meter – are not tested for the glycemic index. Most of the time when a food is tested for the glycemic index, there is a substantial amount of variation of the people in the study, so it's difficult to tell how any given person will react to a food. A 2015 study by Zeevi et al studied people given standard meals and found that although each person reacted similarly to foods on different days, there was sometimes a tremendous amount of variation between people eating the same thing. Different recipes, varieties of plants, and ways of preparing foods yield different values, as do different laboratory techniques. There are different listings for various cakes, with GIs ranging from 38 to 87, for example. Peaches are usually said to have a glycemic index of 42. This number, however, is the average from two different studies — an Italian one, in which the average GI was determined to be 56, and a Canadian one, in which the average GI was 28. Two foods have a GI over 90 —​ parsnips and amaranth. Potatoes, honey, and some processed cereals are above 80, and sports drinks, white bread, white rice, watermelon, and some processed baked goods rank in the 70s. At the low end of the scale, with GIs below 40, are various beans, grapefruit, and nuts. By far, most of the foods tested have GIs between 40 and 70. Remembering that GIs are based on averages and not exact numbers, it is difficult if not impossible to tell if any true differences between the majority of the foods exist. We don’t eat one food at a time. If we eat a lot of different carbohydrate foods in a meal, how do we count it? Protein and fat tend to lower the glycemic index in a meal, but we have no way of knowing how much, short of each person testing his or her own blood (which is unreasonable in everyday life). The glycemic load was invented to account for serving size since we seldom eat exactly 50 grams of carbs from any one food. Theoretically, the glycemic load should resolve some of the problems inherent in the glycemic index. However, one of the basic problems with the glycemic load is that it is based on the glycemic index, so it has many of the same difficulties. Although many studies have shown value in using the glycemic index, others that haven't shown positive results have had some of these problems. For example, in a 2006 study, researchers essentially guessed at GI values for foods, not on the list (giving cheese the same GI as milk, for example). This research also shows the problem with range, as very few people in the study ate a diet classified as low GI; almost all ate a diet with quite a high glycemic index or load, so it isn't surprising that results weren't conclusive. There is no doubt that eating a low-glycemic diet is a good thing. And the research on the glycemic index does give us a few clear guidelines, such as minimizing potato consumption. However, I think at this stage of the game, it is a better idea to just go with the total amount of carbohydrate. Carbohydrate does raise blood glucose, and insulin must be released to stabilize it. The easiest way to limit the problems caused by high glycemic foods is simply to follow a reduced-carbohydrate diet. Foster-Powell, Kaye, Holt, Susanna and Brand-Miller, Janette. "International table of glycemic index and glycemic load values: 2002." American Journal of Clinical Nutrition. 76,:1: 5-56 (2002). Lui, S., Willett, WC, et al. "A prospective study of dietary glycemic load, carbohydrate intake, and risk of coronary heart disease in US women.." American Journal of Clinical Nutrition. 71(6):1455-61. (2001). Mayer-Davis, E.J., Dhawan, A et al. "Towards understanding of glycaemic index and glycaemic load in habitual diet: associations with measures of glycaemia in the Insulin Resistance Atherosclerosis Study.." British Nutrition Journal. 95(2):397-405. (2006). Salmeron, J, Manson, JE, et al. "Dietary fiber, glycemic load, and risk of non-insulin-dependent diabetes mellitus in women.." Journal of the American Medical Association. 12;277(6):472-7. (1997). Zeevi, D. Korem N. et al. Personalized Nutrition by Prediction of Glycemic ResponsesCell. 163:(5):1079-94. November 2015.